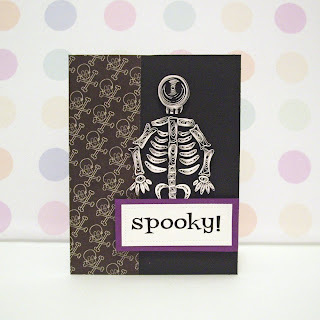 I'm in Halloween mode - I've been creating halloween cards and wanted to quill something different - I went to Hobby Lobby looking for scrapbook paper and came across some cool skulls paper, and decided I was going to make a skeleton. I went home, got on the internet looking up cartoon skeletons, it took me hours to finish but when it was done - all I can say is that I love it! I call him Spooky Skeleton, I almost don't want to sell him he's so cool.